An inversion chair for back pain can help alleviate daily aches and improve your physical and emotional health. Even if you don’t have back issues, maybe you want to be a little taller or just want to incorporate something unique into your daily workout routine. An inversion therapy chair may be an excellent option for several reasons. Our inversion chair reviews will reveal some of the best on the market and share everything you should know about each one. In addition to showcasing our top pick for the best inversion chair, we’ll provide a comprehensive guide to help point you to the best product for your needs. Before you learn everything you need to know about inversion chairs, let us give you a sneak peek of our pick for the best inversion chair. The Stamina Inline Inversion Chair is our top choice for inversion chairs because it’s versatile, supportive, durable, and well-made. Back and joint pain is not only uncomfortable, but it can affect mobility, one’s mood, and even productivity at work. If you’re one of the millions of people who suffer from back and neck pain, issues with sciatica or pinched nerves, there’s a good chance you’re still looking for effective pain relief. Inversion therapy can help. The main difference between inversion tables and chairs is their positioning. On an inversion table, you lay down flat and tilt yourself upside down (which often requires a second set of hands). An inversion chair is often more comfortable, especially for individuals with limited mobility and joint pain. Many people feel a little more “in control” and safer in a chair rather than a table. Chairs are typically easier to maneuver on your own, so you don’t need someone’s help. In general, inversion chairs are more versatile and suitable for a variety of users than a table. What Does An Inversion Chair Do For You? Inversion therapy is a relatively simple concept, but it’s hardly new. Many people give credit to Hippocrates for coming up with the idea of inversion therapy way back in 460 B.C., and whether or not it’s true is debatable, but the therapy has been popular for quite a few decades. For most individuals who do inversion therapy, multiple sessions are required to maintain pain relief rather than the therapy offering long term relief. We already mentioned the main difference between a chair and a table. While the positioning and comfort may differ, the purpose of the chair and the table are the same: to stretch the spine, relieve pressure, and alleviate pain. Inversion therapy may not be ideal for everyone, but there are many benefits. Here are the some of the key benefits that you might experience with the best inversion chair. One of the main reasons that individuals try out inversion chairs is to get rid of back pain. Back pain can be hard to treat because it can stem from any number of issues from old injuries to poor spine health. When people have back pain, they often start to posture differently (in efforts to alleviate pain) such as slouching. Poor posture can lead to an imbalance in the alignment, and then the pain can actually get worse rather than better. An inversion chair can help to stretch and straighten the spine. Studies show that people who used inversion therapy for 3 minutes at a 60-degree angle had a stronger spine, a more flexible torso, and less low back pain. If you have poor spine health, you’re not alone. Lifestyle, bad posture, injuries due to overexertion, and other factors can affect your spine. The spaces between your spinal discs can become smaller, and pressure can increase (which can lead to collapsed vertebra and other issues) when your spine is unhealthy. An inversion chair can help improve and even restore the space between the discs and reduce pressure. Although it may take more than a few sessions, your spine health can improve. As your spine gets healthier and your back pain lessens, you are also strengthening your spine. When all of these things are happening together, you may start to notice an increase in your flexibility and your movements may become more fluid. Some individuals have back issues that make them a candidate for back surgery and sometimes inversion therapy can eliminate the likelihood of surgery. As with all benefits, there is no guarantee, but an inversion chair may be a cheaper, safer and more comfortable alternative. If you want to increase your height, an inversion chair won’t actually help you grow, but it can help with decompressing your spine and stretching your muscles, which can help you stand at your natural maximum height. Many workout routines revolve around strengthening the core, and an inversion chair can be a helpful tool in strengthening your core and improving your flexibility overall (which can help you achieve new fitness goals). Even though there are several benefits to using the best inversion chair, there are a few risks that are worth mentioning, and you should always talk with your doctor before using any type of equipment. Even though inversion chairs are more comfortable and safer than inversion tables, it should be avoided if you are pregnant, obese, use blood clotting medications, or have (had) detached retina. 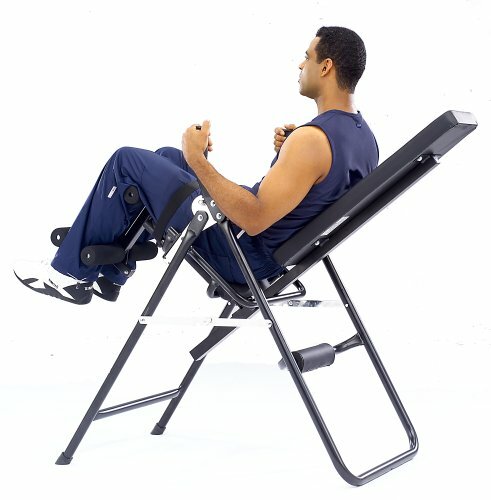 As with any equipment or exercise, inversion chairs should be used for small periods of time in the beginning. Allow yourself to “work up” to longer periods and never overdo it as you can increase your risk of injury. It’s natural to wonder if inversion chairs work and it’s smart to question something before incorporating it into your daily health routine. Like all health and fitness equipment or products, inversion chairs have supporters and naysayers; it’s safe to say that we’re in favor and believe they do work. As we mentioned earlier, inversion therapy has a long history and even before inversion equipment was invented, it is a concept that is popular in yoga practices and other types of stretching. The purpose of an inversion chair is to alleviate the pressure in the spine, and when used properly and at the right angle, the chair decompresses the spine. Many people may be skeptics of the inversion chair because it doesn’t always work immediately or completely eliminate discomfort. 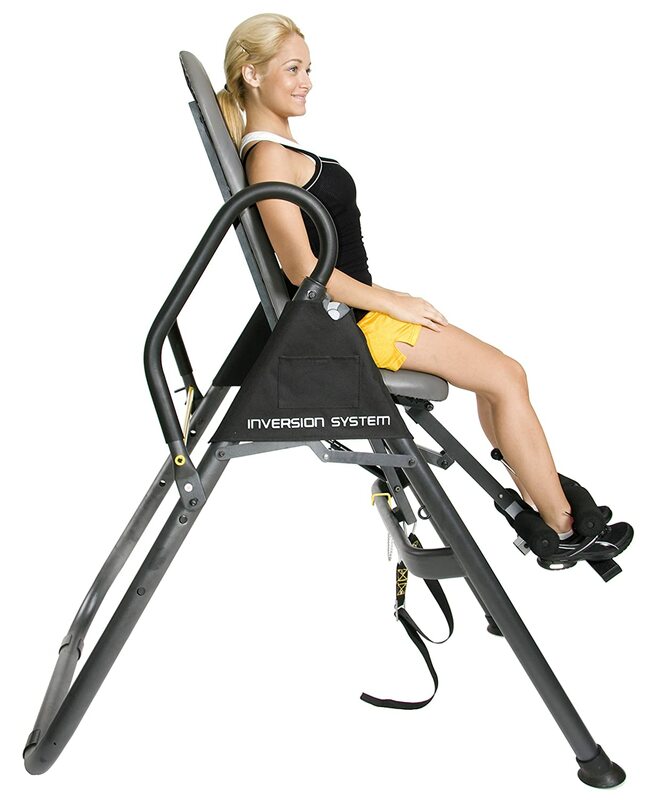 Just like other fitness equipment, an inversion chair is not designed to create “instant” results. With frequent use, and as flexibility and strength increases in the back, the inversion chair can be an essential tool for a healthier back. You might be wondering if an inversion chair is worth trying out. If you are an ideal candidate and are given an “all clear” by your doctor, it’s definitely worth giving it a try. If you are realistic, patient, and don’t expect any overnight miracles, there’s no reason why you can’t try out an inversion chair. Which Inversion Chair Should You Buy? While many of the inversion chairs on the market are designed to do the same thing, some have features that are better suited for your personal needs. If you have limited mobility, it’s best to select an inversion chair that’s easy to use and get in and out of from the start (even if your goal is improved mobility). For safety and comfort, it’s important to pay attention to the weight capacity of the chair, even if your goal is to lose weight. Other factors to consider before buying an inversion chair is where you will put the chair (and if you have enough space for one) and your budget. Once you start browsing for inversion chairs, you may notice that most inversion tables are at least $100 cheaper than most chairs. Keep in mind that an inversion chair is a more comfortable and versatile piece of equipment and that’s reflective when you look at the price tag. Although the prices may vary from one inversion chair to the next, you can expect to pay about $200 to $300 for a high-quality chair. Things To Look For: What Makes A Good Inversion Chair? In general, most inversion chairs look pretty much the same, so you may be hard-pressed to notice any major differences in one brand from the next. We only reviewed inversion chairs that we thought were good options but here are some things you should look for in an inversion chair. A good inversion chair is well-made. When you sit on an inversion chair, you should never wonder or worry about it not holding up. Keep in mind that if you’ve never used an inversion chair, they take a little getting used to, but you should feel balanced and safe (the chair should not wobble). High-quality inversion chairs have heavy-duty steel frames and rubber floor protectors that keep the chair from sliding around. While a good inversion chair has padded ankle supports to help you stay safely (and comfortably) in position, look for a chair with lap belts if you want a little added security. For optimal safety, remember to select a chair with the appropriate weight capacity for your needs. Whether you plan to use your inversion chair a few times a week or a few times a month, it needs to be comfortable. An uncomfortable chair will keep you from loosening up and relaxing, and if you can’t stand to use the chair, you’re less likely to use it, and it ends up being a waste of money. Adequate cushioning on the seat and backrest are essential for comfort, but it’s also important to look for a chair that is adjustable. If you use a chair that can’t be adjusted to fit your height, you are more likely to feel discomfort and not reap the benefits of an inversion chair. Remember, a good inversion chair should relieve pain not cause more. The inversion chair you choose should be easy to use, especially when you are by yourself. Before you use your inversion chair, read the manual and any other material that’s included and watching a few videos on how to use the chair can be helpful, too. When trying out your chair for the first time, it’s a good idea to have someone else around just in case you encounter any issues or need some help getting in and out of your chair. As with any piece of fitness equipment, don’t use the chair when you’re not feeling well, experiencing debilitating pain, or don’t feel confident to use the equipment on your own. In addition to being easy to use, the setup should be quick and uncomplicated. As we mentioned earlier, be prepared to pay at least $200 for a good inversion chair. While most inversion tables cost less, you are paying for quality and features in a chair that isn’t in a table. While it’s possible to find an inversion chair that costs significantly more than $200, be cautious about purchasing one that’s less than $200. If the price seems a little too good to be true, it probably is and isn’t a high-quality or safe inversion chair. If you want a healthier back and body overall, you need to be prepared to invest a little money into the best inversion chair. Some inversion chairs fold up, and others do not so it’s important to make sure you’ve got enough space for one (regardless of whether or not it folds up for storage). If you plan on using the chair on a regular basis, folding up the chair after each use may be a little inconveniencing, especially if you have all the adjustments “just right.” If you don’t want to worry about the setup, make sure you have adequate space before purchasing a chair. Having the inversion chair set up all the time is likely to get more use than one that’s stored away. Studies show that inversion therapy is most beneficial at 60-degree angles or more. To get the most from your inversion chair, make sure that the chair is flexible and can move to an angle of at least 60 degrees. While a good inversion chair should offer a variety of angles, it should also be easy to adjust and start out with small angles. Inversion therapy is safest and works best when you slowly increase your inversion angle; too much at once can be uncomfortable. A good inversion chair doesn’t need an extra “bells and whistles.” Since it’s different than other types of fitness equipment, you aren’t likely to find (or need) add-ons like water bottle holders or fitness monitors. If you do want to monitor your heart rate and other health stats while using an inversion chairs, a wearable device is a great and comfortable option. The “extras” you should look for and consider is safety straps (such as lap belts), or padded arm/hand rests. Some inversion chairs convert to an inversion table so if you’re interested in that feature, read the inversion chair reviews carefully. As we mentioned earlier, weight capacity is an important feature to consider when shopping for an inversion chair. Even if you are on a weight loss journey, the best inversion chair for you should be able to safely and accommodate your current weight (not your weight goal). Selecting an inversion chair with a larger weight capacity is also a great idea for households where the chair might be used by more than one person. The larger the weight capacity, the sturdier and more durable the inversion chair. When checking out inversion chair reviews, don’t forget to see if there’s warranty on the chair. For more people, an inversion chair is a worthy financial investment, but even things can go wrong with the best inversion chair. Whether you run into a mechanical error or you simply don’t like how the chair works or feels after using it for a few months, you want to have the option to replace or return the chair. A good inversion chair should have a warranty of at least a year. Read the warranty details before purchasing the chair and make sure you understand everything or that the warranty seems fair. You may have the option to purchase an extended warranty for a small additional fee. Like most fitness equipment that you purchase online or even in a store, you will probably have to assemble some parts of your inversion chair. If you have the option to have it assembled for you, it may be worth the extra cost, but if not, it shouldn’t be too difficult if you need to assemble it yourself. Before you decide which inversion chair to purchase, see how much assembly is required, if there are tools included, and if the directions are clear; you can often download an instructional manual without purchasing the chair. When you purchase a chair that needs assembling always have the manual ready, count and identify all the parts before putting the chair together. Having someone help you is a good idea, too. Once your chair is all set up and ready to try out, don’t toss out the packaging or the manual as you never know if you will need to use them as a reference or if you need to return your chair. Before you select your inversion chair, it’s always a good idea to make sure there’s 24/7 customer support available. Whether you have questions about assembling your chair, how to use the chair, or needs some troubleshooting advice, customer support is essential. If you’re spending the money on a good inversion chair, you deserve to have adequate support whenever it’s most convenient for you. 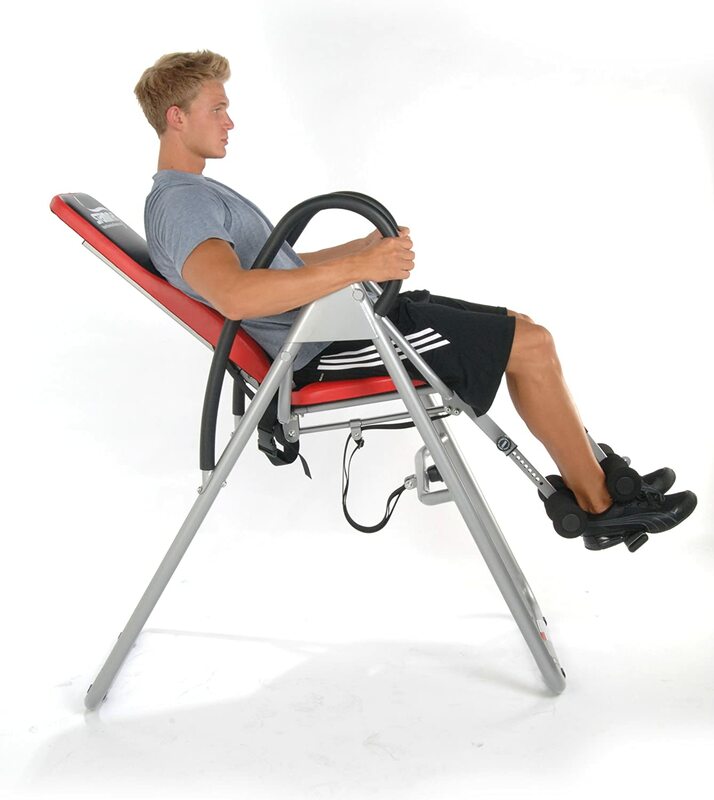 The Health Mark Pro Inversion Therapy Chair is not only suitable for inversion therapy but due to the design of the chair, we selected it as the best inversion chair for fitness. With multiple adjustments up to 70 degrees, users of this chair can easily and comfortably adjust to using an inversion chair. Padded rolled leg supports and a padded adjustable backrest make the chair an ideal piece of equipment for performing core strengthening exercises such as inverted crunches and reverse v-ups. Even if you’re not looking for an inversion chair to help you meet fitness goals, it’s a great option for any fitness goals in the future. Since this chair stays in a seated position while inverting at any angle, it’s a comfortable and secure option for first time users and people with limited mobility. Who Benefits From This Inversion Chair? The ideal user of this chair is anyone who is a good candidate for inversion therapy. If your range of motion is limited, have poor balance, or just want to feel a little more secure and “controlled” in your movements, this chair is a good choice. If you weigh more than the maximum weight capacity or have any of the health risks that we mentioned earlier (such as cardiovascular issues) this inversion chair is not a good option. Instead, you should talk with your doctor about other alternatives for inversion therapy. A good inversion chair should be adjustable and be accommodating to users of various heights, but sometimes chairs that work well for tall people over six feet tall are difficult for shorter individuals. This chair is a great option for anyone six feet tall and shorter. The Stamina Seated Inversion Chair is one of our favorites because not only does it feature all the best qualities of an inversion chair but users also have the option to use it as an inversion table. Having multiple adjustment options makes it a versatile piece of fitness equipment for an individual, regardless of their mobility. This chair has adequate padding on the seat and ankle supports while the ergonomic and padded handlebars help you feel more in control as you get used to inverting at different angles. The ideal user of this chair is anyone who is under 6 feet tall, weighs less than 250 pounds, and would benefit from inversion therapy. This chair is a little more versatile which means that while as you progress with regular use of the chair, you may feel comfortable enough to try the full-inversion option (and don’t have to buy an inversion table). While this chair is a great option for beginners and anyone with limited mobility, it’s not a “big and tall” friendly inversion chair. Like other inversion chairs, if you have health issues that make inversion chairs risky to your well-being, this chair is not a good option, and you should seek other alternatives. Although we prefer inversion chairs over tables, we know that many inversion users like to have the best of both worlds but don’t want to own two separate pieces of equipment. The Body Power Seated Deluxe Inversion System is a great option for someone who wants options and the ability to store the equipment. Much like the other inversion chairs we reviewed, this chair has all the basic features when it comes to inversion therapy, and the full-inversion option is a bonus for some users who are hoping to get a bigger, longer full-body stretch. This chair has adequate padding on the seat, ankle supports, and handlebars for comfort regardless of which angle you stretch. Anyone who fits the height and weight requirements of this inversion chair is a good candidate. Although this chair sturdy enough and adjusts for someone who is 6’5” and weighs 300 pounds, it may not be comfortable as the design is smaller and narrower than comparable models. While we love the versatility of this chair, it feels more comfortable as an inversion table and lacks the comfort and control of an inversion chair. If health problems prevent you from inversion therapy, you should seek out other alternatives. There are things we like about all the inversion chairs we reviewed, and we wouldn’t recommend an inversion chair that we didn’t like. While we are confident in each chair’s ability to help relieve back pain and deliver other benefits of inversion therapy, our favorite chair is the Stamina Inline Inversion Chair. The Stamina Inline Inversion Chair is a high-quality, durable, and versatile inversion chair that is perfect for beginners of inversion therapy and anyone with limited mobility. The adequate padding, safety belt, steel construction, and slip-resistant foot protectors keep the chair comfortable and stable during the inversion process. This chair has all of the features we expect in an inversion chair, and the ability to fully invert is just a bonus. Although this chair does not fold up for storage, we’re confident that you will be so happy with this chair that you’ll never want to put it away. Let the Stamina Inline Inversion Chair help you alleviate back pain and improve your mobility so you can enjoy everyday activities. Some recommended products may use affiliate links. ProInversionTherapy.com is a participant in the Amazon Services LLC Associates Program, an affiliate advertising program designed to provide a means for sites to earn advertising fees by advertising and linking to Amazon.com. Amazon and the Amazon logo are trademarks of Amazon.com, Inc or its affiliates. 2019 Pro Inversion Therapy. All rights reserved.